The vast majority of misdemeanors in the late 1970s did not result in jail time, and that is still true today. So, if there’s no jail time, what happens instead? Does the judge just let everyone off with a warning? Of course not. Okay, but instead of jail time what sort of penalty can the judge impose? Argersinger and Scott together had made clear that the mere “threat” of jail time does not trigger the right to counsel into action. This “threat” of jail time is actually a real thing. It’s called probation. 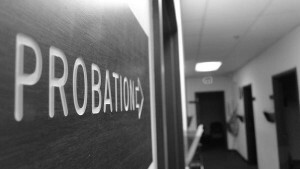 The overarching principle behind probation is that we all believe the vast number of misdemeanor offenders can actually remain productive members of the community, and therefore they should be granted the opportunity to prove that they’ve learned from their mistakes rather than be ushered straight to jail. And so, the judge will make a trade: I, the judge, will suspend your jail sentence for a period of time, if you comply with each of the following conditions. And those conditions might be to pay a bunch of fines and court fees, to attend drug or alcohol treatment classes, or to provide a certain number of hours of community service. And if, by the end of the probation term (which could be anywhere from a few months to a few years) the individual has complied all of the conditions in a satisfactory manner, then that’s it – the probation is lifted, the suspended jail sentence goes away completely, and the individual is no longer subject to court supervision. But what if the individual fails? What happens then? Well, here’s the catch: the original jail sentence doesn’t just disappear. The probation can be revoked at any time and, following a hearing before the judge, the suspension can be lifted thereby activating the original jail sentence. Following the Supreme Court’s decision in Scott, many states and local governments presumed that, with the line being drawn at the point of actual imprisonment, they were under no obligation to appoint counsel until the point where they actually intended to affix a jail sentence. Instead, for the average misdemeanor defendant, there would be no right to appointed counsel at the time of the original trial because the person would not actually be placed in jail. Only if the government intends to revoke the individual’s probation, which would thereby activate the original jail sentence, would the government appoint counsel to represent the defendant in the probation revocation hearing – the point when he risked actual jail time. Was this a fair reading of Scott? Or does the defendant in fact have a constitutional right to counsel at the time of the original sentence, and all Scott makes clear is that the judge is prohibited from actually imposing that original sentence unless counsel was provided during the original trial phase? Over the course of the following twenty or so years, this was challenged time and again in state and lower federal courts, with divided results. Finally, in 2002, the U.S. Supreme Court stepped in to settle the conflict, in a vitally important right to counsel case called Alabama v. Shelton. The Supreme Court had settled in 1973’s Gagnon v. Scarpelli that an individual on probation has a right to the assistance of counsel during probation revocation hearings (to some extent), in the same way it had determined this right attached (to some extent) for parolees facing revocation of their paroles in 1972’s Morrissey v. Brewer.